Median household income was $51,000 in 2012, down nine percent from an inflation-adjusted peak of $56,100 in 1999. Most American households experienced no real income gains since the 2008-09 recession. 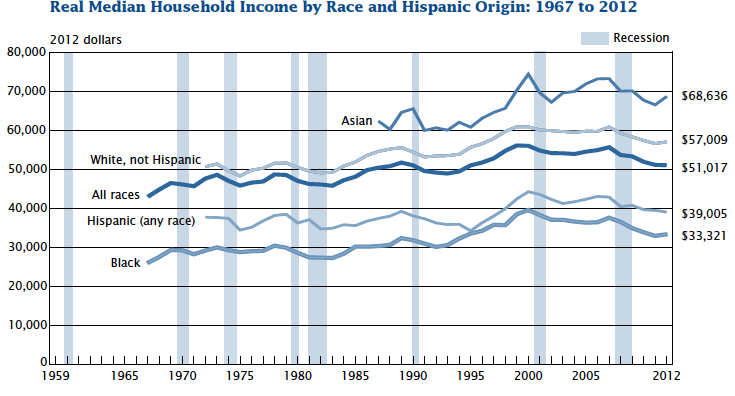 The gaps in median income by the race and ethnicity of the household head were unchanged. The median income of households headed by Asians was $68,600, compared with $57,000 for non-Hispanic whites, $39,000 for Hispanics and $33,300 for Blacks.